Ethan Brooks is the North American Community Leadl to help foster growth and deliver outstanding value to Toptalers around the world. With global competition for talent heating up, particularly in technology, companies increasingly recognize the importance of acquisition and retention. According to Deloitte, “the issues of [talent] retention and engagement have risen to No. 2 in the minds of business leaders, second only to the challenge of building global leadership.” As a result, the process by which organizations attract, retain, and develop talent is rapidly evolving. Not all companies approach talent acquisition the same way, so not all companies reap the same rewards. As with most competitive advantages, talent acquisition depends largely on the “secret sauce” that culminates from a combination of a company’s culture, a carefully built team, and a meticulously refined process. While the recipe requires top companies years to perfect, some of its ingredients are readily available for aspiring talent-seekers. In this article, we look behind the scenes at some of Toptal’s best practices for talent acquisition. Our goal is to provide an “open source” summary of the critical components that we - and other leading organizations - use to attract and build lasting relationships with the top 1% of talent. In order to attract the world’s elite talent, organizations must first recognize that the best talent face an abundance of options. This idea lies at the heart of the strategy we’re going to share. The world’s top talent face an abundance of options. Global demand for technical talent far outstrips supply. Demand for engineers with blockchain expertise, for example, has increased tremendously as organizations around the world have begun recognizing the positive implications of distributed ledger technologies. Globally, there are fourteen job openings for every qualified blockchain developer in existence. At Toptal we have seen more than a 700% increase in clients searching for top-notch blockchain developers in the last year alone. Geographic limitations are disappearing too. Talent can now work with organizations across the country and around the world. While this gives companies access to a much broader pool of potential candidates, their expanded reach also increases competition for top talent. So, how can a company motivate someone with a lot of options to join, much less remain on its team? For the answer, we turn to a psychologist from Brooklyn who became one of the world’s leading authorities on what drives people. Ranked among the most-cited psychologists of the 20th century, Abraham Maslow is perhaps best known for the pyramid that bears his name. In his paper, A Theory of Human Motivation, published in 1943, Maslow laid out a framework for ideal human development. Unlike many psychologists of his day, who studied those who were unwell, Maslow studied those at the top of their games, including elite university students, and iconic figures like Abraham Lincoln, Jane Addams, and Albert Einstein. He called these people “self-actualized”, and the key to their success, he said, lay in their ability to progressively fulfill a variety of needs. 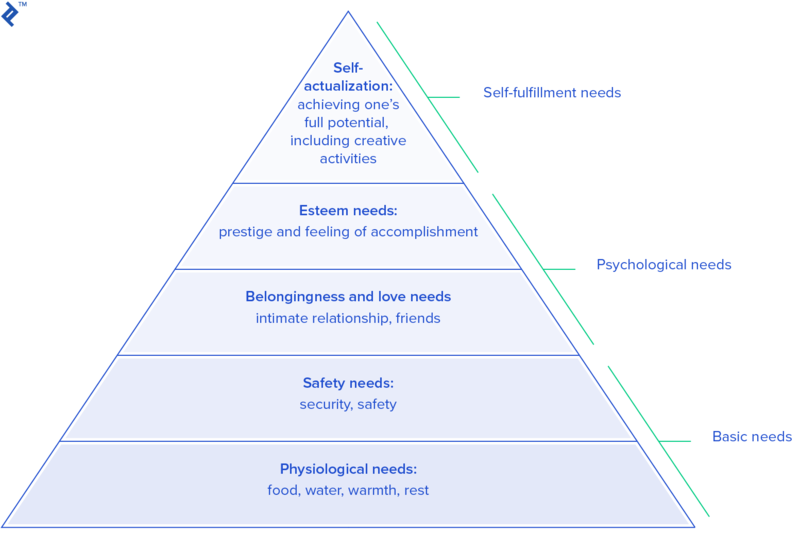 According to Maslow, humans have a series of core needs. These include basic physiological needs, like warmth and sleep, all the way up to what he coined as “self-actualization needs,” like achieving one’s full potential, giving back, and partaking in creative endeavors. His theory was that self-actualized people reached progressively higher levels along the pyramid, and that in order to progress sustainably, individuals first needed to meet their needs at each lower level. Perhaps more importantly, he claimed that those who reached self-actualization (A-players) were motivated primarily by continual growth, not by the meeting of needs alone. In other words, it was not enough for them to simply meet a need and stay there. They were driven by growth, rather than safety or assuredness. This helps explain why pay alone is often insufficient to keep top performers in unfulfilling roles. It’s not enough to simply meet a need in one dimension. Top talent are motivated by the ability to continually learn, and push themselves to the next level. This must be baked into your strategy if you’re to be their best option. Many organizations have taken this insight to heart. As John Pirog – Senior Director for Digital Development at Motorola Solutions – explains, results improve when you shape your strategy around people who crave growth. The companies that are able to attract and retain the world’s top talent are those that offer opportunities for continual growth. But how, specifically, do we develop opportunities for growth? There are countless ways to facilitate continual growth, and no organization can have all the answers. Figuring out which opportunities top talent crave is a continuous process of discovery. At Toptal, after years of working with the world’s elite agile talent, we’re still continually analyzing their needs and testing new programs to offer opportunities for ongoing development. In fact, we have a dedicated Community Team with members on three continents whose sole focus is analyzing the needs of our community, and developing new and interesting opportunities for them. In order to identify, test, and analyze programs and initiatives of value, the Community Team uses a framework we’ll call an Opportunity Loop. The Opportunity Loop is closely related to the idea of agile development, which favors collaboration, quick feedback cycles, and continual improvement. Agile was originally designed to help develop software, but its ideas can be applied to other complex environments. The Opportunity Loop consists of three steps: Analyze, Test, Listen… Repeat. Any effort designed to help an organization attract and retain top talent should be structured as an Opportunity Loop. There are many ways to do this, and we’ll use specific examples to examine each stage of the cycle more closely. The first step is to analyze the people an organization is trying to attract, and determine what they want. Start with Maslow’s Hierarchy, and brainstorm things that the desired talent might value at each level of the pyramid. How is the organization delivering on these things, and how is the organization helping talent transition from one level to the next? At Toptal, our Community Leader program is designed to deliver value at several levels of the pyramid, and to facilitate growth between levels. Community Leaders are Toptalers from around the globe who volunteer to help oversee and cultivate the community both online and in-person. Leaders are extremely active in the community – helping with everything from events to mentoring new Toptalers – and are integral to the success of our programs. Through their work, not only do leaders derive a sense of growth and personal satisfaction, but they also help to deliver similar value to members across the community. With the help of Community Leaders, the Community Team continually analyzes the needs of our global network on a granular and targeted level. When we identify an opportunity to provide outstanding value, we move to the next stage of the Opportunity Loop, testing. The testing stage is where you will implement a small-scale or temporary version of your idea. It allows you to try a program you think talent will value, and look for proof that it’s working before committing large-scale resources to implementing fully. It can be done for programs at all levels of the pyramid. Toptal events are an important part of the way we interact with and provide value for our community. Several times each year we implement new and interesting event types to deliver value for members of our network. Testing helps us to identify whether an initiative we think would be valuable is actually valued by our talent. Recall that retaining top talent is all about being their best option. Because everyone has different goals for their career at different stages, the testing phase helps us to identify where members of our community are in their journey, and what might help them push to the next level. The Community Leader program is instrumental in helping us to do this. Sometimes, an idea is tested with the leaders themselves who constitute an accurate cross-section of the community as a whole. Other times, a handful of leaders will implement the new event within their communities. If feedback is strong, we invest time, energy, and resources in formalizing and scaling further. Tests can take many forms. What’s most important at this stage is to approach the situation with an open mind, and to remember that, though it may be uncomfortable at first, opportunity springs from stepping outside your comfort zone and trying something new. For John Pirog and Motorola, allowing people to try different roles and gain new skills has proven key to developing talent internally. “What we do a lot is move people around to give them opportunities to grow,” Pirog says. Once you’ve implemented your test, it’s time for the last stage of the Opportunity Loop, listening. You must ensure systems are in place to receive feedback on your tests. Such systems can take many forms, from surveys to team leaders who report up the chain, but it’s critical that information flows two ways inside your organization. Feedback does not always have to focus solely on that which is quantifiable. As the sociologist William Bruce Cameron once wrote, “Not everything that can be counted counts, and not everything that counts can be counted.” Indeed, when dealing with people, it’s often important to suspend number-crunching in favor of person-to-person exchange and anecdotal evidence. At Toptal, Community Leaders are crucial in helping us understand how the community feels about any given initiative. As members of the community, they are able to provide direct feedback on tests we run. They can also offer feedback from one-on-one interactions with fellow Toptalers, acting as our eyes and ears in cities around the world. At Motorola Solutions, managers go out of their way to solicit feedback from the company’s talent by proactively meeting employees biannually and working to understand what direction they’d like their career to take. Listen to how your community reacts, and proceed based on that information. It’s important during the listening stage to be empathetic and open minded. Organizations and leaders must avoid the natural urge to be biased towards their own projects or opinions, or to skew feedback to fit their idea of what should be popular. Maintain a healthy detachment from tests and let the feedback speak for itself. Then keep what works, and either adapt or scrap what doesn’t. It’s one thing to attract top talent. It’s quite another to keep them. If an organization is going to compete long term then it must focus on how it will retain the elite players it brings in. The needs of top talent evolve. Think back to Maslow’s Hierarchy. Top talent are motivated by growth, and the trick to remaining their best option is to provide a rich set of opportunities for them to continue growing along that pyramid. The Opportunity Loop must always be running. If your feedback lines remain open, and you continually analyze the information that comes in, develop ideas to deliver value, test, and collect feedback, then your organization will inevitably continue to grow and evolve alongside your talent. As a result, talent will feel fulfilled and happy to remain with the organization. Further, both the organization and the people inside it, will be motivated to continually develop their skills, expand horizons, and tackle new challenges ahead.